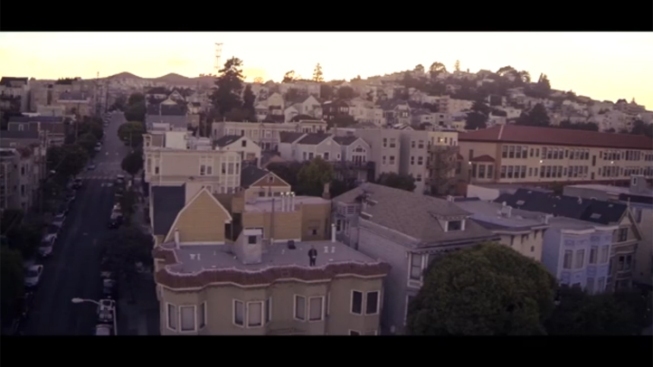 A San Francisco man has strapped a camera to a private drone. "Drone cinematographer" shared his aerial video on the website Vimeo. Drones are over San Francisco, taking photographs, taking video. And it's quite lovely. Nathan Shipley is a "drone cinematographer," according to SF Weekly, and has recorded some very nice shots of the sunset from Bernal Heights using a Go Pro camera-equipped DJI Phantom Quadracopter, according to the Bernalwood neighborhood blog nonpareil. Over Bernal Hill and Mission Dolores from Nathan Shipley on Vimeo. As for the response? It's hardly NSA-worthy. "Dogs love chasing the drone," he said, though he noted that high winds almost sent the drone into a person.